How ever the town of Arusha, Tanzania may pitch itself to the world (one reference is apparently “The Geneva of Africa”) it is in essence a pit stop. Arusha is where travellers from all over the world break their journey on the overland route between Nairobi and Dar Es Salaam (as we did in late October), or else camp for the night before forging onward to Serengeti National Park or Mount Kilimanjaro. As such, Arusha’s streets are chockablock with buses, safari vans and giant SUVs owned by flush tour operators. And hungry pedestrians in transit. 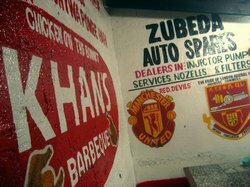 One enterprise that has embraced this situation with some delicious genius is wheeler mealer Zubeda Auto Spares / Khan’s Barbeque. By day, it sells auto parts to vehicles trundling through town. By night, it sells some of the best damn Pakistani-style BBQ chicken parts I’ve tasted anywhere for the travellers pouring out of said vehicles. Slot yourself into one of the long bench tables (or simply lower your SUV window if you want to eat in your plush vehicle), place your order, then go build your own salad that comes with each meal. I particularly liked the green tomato achar (pickle) salad. Beware: this is one of the few eateries in East Africa where when they tell you something is spicy, they mean it’s spicy (I learned this the hard teary-sweaty-snotty way). The other thing the more sensible among you need to be aware of, is that 1 order of chicken at Khan’s means 1 whole chicken. We unknowingly ordered 2. Which meant we had the most badass snacks on the bus to Dar Es Salaam the next day. Twas the proverbial dark and stormy night when we ate at Khan’s. In these parts, this often means that power cuts out for hours on end. 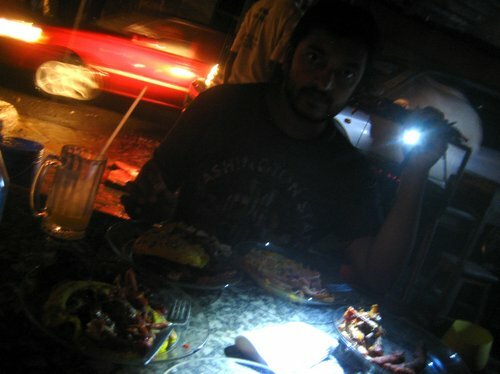 So while waiting for Khan’s backup generator to kick in, we dined by Maglite and SUV headlight… same way the grill chefs soldiered on. 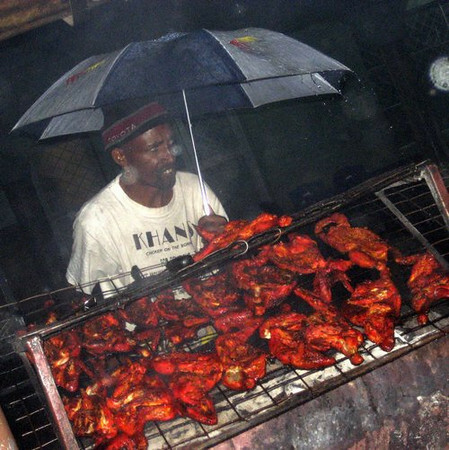 Having lived in London, I had full appreciation of their stoicism while BBQing in the rain. 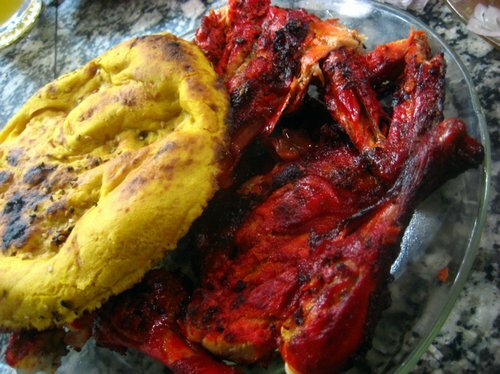 So we made another pit stop at Khan’s on the road back to Nairobi a week later. As tender, juicy, spicy and smoky as the chicken was, I was glad to be moving on. If Khan’s were in my neighbourhood I’d find myself there embarassingly often. Eat frequently enough at a place like this, and you’re bound to eventually get a spare tyre for free. And I don’t mean the type you can run your car on. My best meal in Zanzibar found me through a thicket of seaweed. It was low tide on a November morning at Jambiani village, on Zanzibar’s south-east coast. Out into the horizon, women were either bent over picking or walking back to shore with giant sacks of seaweed on their heads. Patches of the stuff were sorted by hue and laid out to dry in front of many of the concrete and coconut-leaf-thatch huts in the village, like bonsai astroturf lawns. What did they do with so much seaweed? Our hostel manager said the seaweed was used for food. The dude who took us sailing and snorkelling on his dhow the next day concurred. Fabulous. A locally foraged delicacy. Get me some-o-dat. Except our hostel chef looked at me like I was crazy. He asked me how to cook it. How ever the villagers cooked it, I said. He didn’t know, he said, he’d never cooked it before. He didn’t know anyone here who ate it. Maybe I could show him what to do with it. Tsk. If anything not fillet-able is coming out of the sea in large quantities, it’s probably going to us bloody Asians (ok and maybe the Spaniards). Later in my research I found out the seaweed out here is farmed, not foraged. And it gets sent off to processing centres like Singapore to be turned into agar (vegetarian gelatin) and food stabilisers that go into all sorts of processed food, and toothpaste. The things that happen to your food right under your nose! I had grown up on Grandma’s agar jellies. So this is where they came from. But was brushing my teeth the only way I’d get to taste some seaweed while I was out here at the source? Another walk the next morning, this time north to Paje. Much more real estate development here, but a similar seaweed scene. All that fresh, crunchy, briny sea-mineral-filled goodness, just going far far away to Asia. Bah. Out popped this guy on the beach. A Captain Hadji, and a pitch for a fish lunch at his home-restaurant. How much, I asked, wary of a fat bill no one agreed on after the meal. 7,000 Tanzanian shillings. (~£3.20) Very fresh, he said. Can we see the fish? Babs asked. “Can we come with you to the boats?” I asked. “Ok, you come, you come,” he said. Captain Hadji chuckled at me. And so Babs and I sat on the beach and waited for the tide. And sure enough, at noon, the fishing boats came, dragged through the shallows up to shore by their various captains and 1-man crews. Captain Hadji waded out to meet them. Babs and I waded out after him. No one had nets or lines. Just fishing spears. Little piles on reef fish. One boat had a baby shark. Fwah! “Ok I have your fish. I go get seaweed. You come at 1pm for lunch,” said Captain Hadji. “Fine. Great,” I said, still gawking at the shark. I was happy to have some fellow gawkers for company onshore. Various villagers came to gather round the 50kg shark, including a blind boy who squatted with it, running his hand along its cool leathery skin and its many pointed teeth. Then came the next course of entertainment and education. Next to the shark, fishermen from various boats came up with sacks and buckets and emptied out piles upon piles of beautiful giant starfish. Our little patch of Paje turned a gentle acid-trip of technicolour. What do you do with the starfish? I asked each villager until I found someone who spoke enough English. My heart was clenched, ready to break if they said they sold it as curios to tourists. “For fish. Catch fish. Put in traps. Fish eat. Catch fish,” someone finally told me. I still didn’t feel great about what that meant for the coral reef. But it beat putting them on a shelf so that some idiot could brag to their friends about how at one they felt with marine life at some exotic location. It was 1pm. Time for the main course. Babs and I trooped over to Captain Hadji’s porch, soggy, sunburned and starving. He was just getting to putting the fish on his charcoal grill. It was white snapper and red snapper today, he said. Marinated in salt, pepper, ginger, garlic and lime juice. With rice cooked in coconut milk. I recognised the spots on the “red snapper”. It was actually red garoupa, a premium fish in Chinese restaurants prized for its sweet, delicately flaky flesh. My Dad and I are both mad fans. Good Lord, everything in the water here must be heading for the far east. Babs and I wolfed everything down, picking through each crevice of the heads, the cheeks and the eyes with surgical precision. Captain Hadji wasn’t kidding about “very fresh”. I still don’t know when I’ll get to eat fish this fresh again, barring joining a fishing expedition and cutting up some sashimi or ceviche on the boat. And he did good on the seaweed. It came stir fried with a little garlic, a little tomato, a touch of masala. Crunchy briny magic. The two Swedish women who had also signed up for lunch didn’t get any. They had asked Captain Hadji to remove the fish heads from their lunch, so they didn’t deserve any, in my mind. I wish I had overheard them at the time. I would’ve demanded to rescue their fish heads. I hoped at least this meant Captain Hadji and his family would eat them. The bill for the fish was as agreed. We both had soda. “Pay what you want for the seaweed,” said Captain Hadji. So we put in 10,000 TZS each. 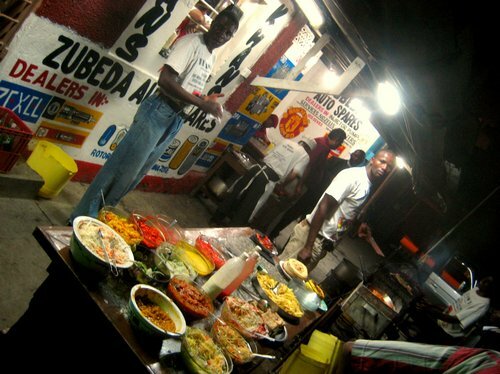 Our best meal in Zanzibar cost us a grand total of £9. The food and the service were both ten out of ten. The ambience, something I don’t usually don’t pay much attention to… in this case… out of ten… scores… to be conservative… about a million. “Okay. So. On a scale of 1 to 10, 1 being ‘Wen you’re being an idiot, just stop this nonsense now’, and 10 being ‘helllllllll yeeeeeeah’, where would you say you are?” I asked Babs and Louise, our fabulous host in Dubai. ” ‘On a scale?’ You are SUCH a geek. Seriously,” said Louise. She would know. We used to work together in Singapore. We were at the poultry aisle in Spinney’s, a supermarket chain in Abu Dhabi. In particular, we were all staring at a trough full of frozen Butterball turkeys. It was mid afternoon on Thanksgiving Thursday, and I was testing the momentum behind my crazy idea to throw together an impromptu Thanksgiving dinner out here in the Gulf. If we went through with it, the plan was to buy a turkey now, thaw it in Louise’s car outside while we chatted over cake and coffee, and hope for the best come dinnertime. Given I usually defrost turkeys overnight, there was a serious risk of serving up turkey slices for dinner and turkey popsicles for dessert. But I couldn’t just give up now. Not when we had found any turkey at all out here in the desert. I love turkey. I love its dramatic size, carving it, how its clean firm flesh is such a great canvas for gravy and cranberry. I love picking apart the carcass after dinner, gleefully anticipating a week’s worth of snacks. I love turning a turkey’s lovely bones into a hearty soup or congee. I loved turkey even way back when my family ate store-cooked ones at Christmas, woefully flavourless and so overcooked you choked on its dryness with every mouthful. Back then it wasn’t about eating turkey at Christmas dinners, it was about drowning mostly untouched turkey slices in gravy and mozzerella to make a very messy turkey melt for days afterwards. Then while at university in the US, I got invited to Thanksgiving dinners with various friends’ families, and learnt how to cook turkey myself. Pilgrims pillaging the New World notwithstanding, I like the ritual of sitting down with family and friends with a mountain of food, and being thankful for the year’s bounty of provision and affection. So I took the tradition with me back home to Singapore, and later to London, converting (or at least feeding) a few friends along the way for whom I am thankful. A decade on from my first DIY turkey, was I about to break with my adopted tradition? “Hey look. These turkeys are defrosted already. And they’re halal!” said Herbert, our friend based in Abu Dhabi, coming back from further along the aisle. I am thankful for Herbert! After coffee and cake we zipped back to Herbert’s flat, and within 4 hours had a gorgeous piping hot turkey with homemade gravy and cranberry sauce and Babs’s ever reliable roast potatoes. Herbert even invited over a couple of his friends in town to add to the festive atmosphere. I am thankful for Louise, who housed us, smelly backpacks and all, drove us all over the gleaming desert, and sous-chefed brilliantly for dinner! I am thankful for Herbert, who trusted us with his kitchen even though he was flying to Singapore right after dinner. I hope we cleaned up ok! For Josh and his mother Janet (may she rest in peace), from whom I got the orginal version of the turkey recipe. Early September 2009, Kiyikoy, Turkey. Kiyikoy being one of those increasingly rare places that still have fishing dayboats rather than seafloor-scraping ocean trawlers, Babs and I decided that trekking down to the harbour to see the boats pull in would be a good use of a Saturday night. And what a Saturday night it turned out to be. By the time we sauntered over, there was quite the crowd of men, women and children alike at the breakwaters. Evidently the arrival of the home fleet was the Saturday Night Live event in these parts. After finding myself a place to perch among the locals, I started to muse about how much time these people spent waiting on a regular basis for fishermen fathers, sons, husbands, uncles and brothers to come home. I also started to wonder how closely they watch each incoming catch. After all, a day’s catch for me just determined what kind of dinner I could get for the day — for them it likely determined what their lifestyle might be for the next few days or weeks. The fleet held this line for a long time, just slightly away from the harbour. Too long. What the hell were they doing? Waiting for something? Comparing catches? Colluding on prices? People at the pier were waiting. Watching. Pacing. Exchanging murmurs. Was this not a usual weekend homecoming party of the returning fleet after all? “There’s some drama going on here that I don’t quite understand yet,” I said to Babs. Oh for subtitles in real life! More omens. A guy in a black t-shirt (below) showed up on a motorbike and whipped out a heavy-duty looking camera. And then (I can’t even make this stuff up) I saw a red moon rising. Then finally it became clear. A fishing boat had gotten into trouble and had to be towed back by a big brother of some sort. The nets were completely tangled all over the masts and it was already more than half submerged. Hopefully everyone on the boat got out in time. By now a good chunk of the town was thronging the docks, snapping pictures with phones and cameras (I’m glad it’s not just me!). There was a lot of shouting between men on boats and men on the docks about what needed to be done. A bulldozer / excavator pulled up behind the crowd. More yelling. A lot of rope got thrown around, and tied onto the excavator’s “fingers”. The excavator starts pulling hard on the rope attached to the boat. A horribly painful creaking sound ensued. I managed to grab this one photo before Babs yanked me quite a distance away. “There’s too much water in the boat. That rope is going to snap, and when it does, there’s no way you want to be anywhere near it,” he said. Sure enough, whatever the rope was attached to on the boat cracked and broke away, the rope went flying, and the locals went running and gasping. Damn. Great scout / sailor / engineer instincts, Babs. Yet more shouting. I’m guessing that in the end the plan to tow the boat out of the water got abandoned, because these 2 poor sods were told to go wade in and undo all the roping. The attention of the crowd turned. An empty truck had pulled up to the water’s edge. Somebody’s got to deliver some fish tonight. Another fishing boat — whom in the corner of the crowd’s eye had been quietly sorting and boxing their haul — now pulled up quickly in front of the truck. A man holding an order list yelled out fish names and weights and one box after another got relayed up into the bowels of the truck, none of it even touching terra firma on Kiyikoy. And so I did. His mates looked quite chuffed. Quite a different look on the other boat. This image is the one that often comes to mind now whenever I’m tucking into fish, with a new sense of appreciation of what it can take to get to my plate.